This iteration of New Demands? performed in New York City, commemorated the New York Shirt Waist Strike of 1909-1910 and the Triangle Factory Fire of 1911. 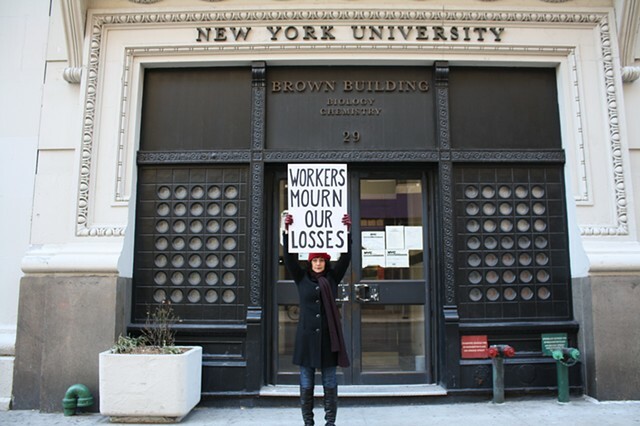 I walked a route that connects sites of historical importance associated with these events: the former Triangle Shirtwaist Factory Building at 2329 Washington Place, now New York University (pictured here); the former headquarters of the International Ladies Garment Workers' Union (ILGWU) at 11 Waverly Place; Cooper Union Auditorium, where workers and the ILGWU voted to go on strike in 1909; and 19-23 St Marks Place (formerly Arlington Hall), site of of a 1910 reception and fundraising event in support of the strikers organized by the Socialist Womens Committee. By connecting these historical sites, the performance also links the history of workers' rights in the garment industry and the American labor movement more generally, to ongoing struggles for better working conditions, particularly in the global garment industry, where workers continue to perish because of unsafe working conditions. The Triangle Factory Fire broke out on March 25, 1911. Fire exits were kept locked by the factory owners, and the outside fire escape led nowhere. 146 women workers died in the fire. This performance commemorates the Triangle Factory Fire, while drawing attention to the fact that 100 years later, garment workers around the world continue to endure unsafe and life threatening working conditions; to work long hours in non-unionized and unregulated factories and sweatshops; and to be paid below average national minimum wages in most countries where they work. The placard used in this performance is adapted from banners carried at the 1911 funeral march held to protest the Tirangle Fire, that read "We Mourn Our Loss".